For most drivers, driving in the rain may not seem like the most pressing safety concern. But according to the United States Department of Transportation, wet pavement contributes to nearly 950,000 automobile crashes each year. From the above statistics, it is clear that driving in the rain can considerably increase the risk of a dangerous situation for you, your family and other road users. Being behind the wheel during a wet weather doesn’t have to be a white-knuckled, gut–wrenching experience. As a motorist, you should know that safety starts even before you get behind the wheel. Be prepared by making sure your car is ready and adjusting some of your driving habits to avoid unwanted road occurrences. 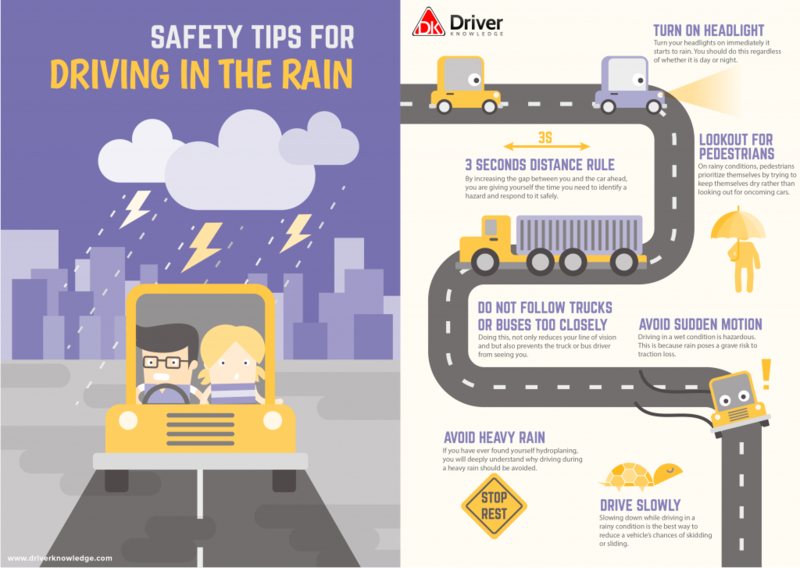 Here are some tips that will help you drive safely in a downpour. Turn your headlights on immediately it starts to rain. You should do this regardless of whether it is day or night. Different states have laws that govern how headlights are used. In some states, you may find yourself on the wrong side of the law if you drive without the headlights on when it’s raining. In others, the headlights should be on when you start using the windshield wipers. By turning your headlights on, you are improving your visibility and letting others on the road know where you are. Rear-end collisions are the most frequent types of accidents on our roads. Statistics by the National Highway Traffic Safety Administration show that the percentage of rear-end accidents to all crashes is between 23–30%. By increasing the gap between you and the car ahead, you are giving yourself the time you need to identify a hazard and respond to it safely. When following a vehicle, choose a road sign, a building or a tree. Note when the vehicle you are following crosses that object. Now see how long it will take you to pass the same object (count 1-1,000; 2-1,000; 3-1,000). If it is less three seconds, you need to fall back a bit. The National Safety Council (NSC) recommends a minimum three-second following distance during dry weather conditions. However, when visibility is low such as during rain, you should increase your safe following distance to a minimum of 6 seconds. Many road deaths are caused by accidents in which pedestrians are involved. A pedestrian is injured every seven minutes and killed every two hours. On rainy conditions, pedestrians prioritize themselves by trying to keep themselves dry rather than looking out for oncoming vehicles. Therefore, it is your duty as the motorist to ensure the pedestrians stay safe. One of the first things people are taught when learning to drive is hazard perception. Developing this important skill ensures that you know where to expect hazards and how to react to them within a split second. Tailing large vehicles such as trucks and busses should not be done closely. Doing this, not only reduces your line of vision and but also prevents the truck or bus driver from seeing you. If you have ever driven a bus or truck, you can get a better understanding of what we mean here. As you sit behind the steering of a larger vehicle, you won’t even notice that there is a smaller vehicle behind you. To add to this, on rainy conditions, the spray given off from the vehicle’s large tires can reduce your driving visibility. So keep a safe distance. Driving in a wet condition is hazardous. This is because rain poses a grave risk to traction loss. To get a clear understanding of this, picture yourself driving on ice. On a slick spot, a bunch of wet leaves can turn into ice. If the motorist makes sudden movements (swerving the wheel or rough gear changes) on such areas, the outcome may be rapidly fatal. Therefore, keep it smooth when you are caught driving in the rain. Even though it is recommended that motorists stay off the road during a heavy downpour, we cannot always prevent driving in the rain. If you have ever found yourself hydroplaning, you will deeply understand why driving during a heavy rain should be avoided. Hydroplaning is when a vehicle travels atop a film of water, and the tires are touching slightly or completely not touching the roadway surface. Slowing down while driving in a rainy condition is the best way to reduce a vehicle’s chances of skidding or sliding. With less than 1/12 inch of water on the road’s surface, tires have to displace 3.79 liters of water per second to keep the rubber in contact with the road’s surface. Therefore, motorists should drive slowly so that their speeds correspond to the amount of water on the roadway.